I have some great memories from my childhood, many of which seem to become more and more lucid the older I get, and the more I watch my own great kids grow. One of my fondest memories was of the Christmas I got my first train set from “Santa” (thanks Mom and Dad; I love you!). It was a Märklin set, and it included an engine just like this one here, same color even! Man I loved that train set, and I played with it day in and day out. Heck, I even had a conductors cap and baton I’d wave about while racing that train around the tracks. Those memories cam rushing back when I saw this scene the other day, so I was glad I had my little pocket Leica with me to score the brackets needed to create this. And, while I did not have my big ol’ Nikon D700 and 24mm PC-E (tilt-shift) lens with me, I knew I’d have no problems getting the “toy” look I was after once I got home to my Mac; once I processed my brackets and got the shot looking the way I wanted, all I had to do was bust out my trusty FocalPoint 2 Software (part of OnOne Software’s Perfect Photo Suite of post-processing goodness) and I was easily able to finish the shot off with a tilt-shift identical to what an expensive tilt-shift lens would give me. Sweet!! BTW, I processed this photograph to the song Train, by 4 Non Blondes. Rockin! Mark Blundell – Great TS work – even if it was in PS. its a lovely image only enhanced by your excellent processing. Chris Wray – Sweet shot and tilt-tastic processing. Love the five-pointed glint off the engine’s windshield. Fun stuff, Jacques! Takes me back to my model train days. Chris Nitz – I love the toy look you got on this! I had no idea FocalPoint was so powerful. Superb shot! Brian Matiash – My man. I’m pretty sure there isn’t an image from you that hasn’t made me smile in appreciation. Rock on! Mike Olbinski – Very, very cool. Jacques – Man you guys are making me blush here!! Thanks! I have to admit I love what FocalPoint 2 helps me to do when I can’t carry my heavy guns to a shoot! Bob Lussier – I’ll bring you back to earth by telling you how much I hate you. I mean that in a brother-loving way. You know … Like when your brother beats you at one-on-one basketball? It only make you want to go out and improve your game. Your images make me want to improve my game. Of course, I feel the same way about the other commenters’ work as well. Jim Denham – What a great pic and trip back in time! I absolutely enjoyed the story of your childhood train Jacques! fantastic post my man! 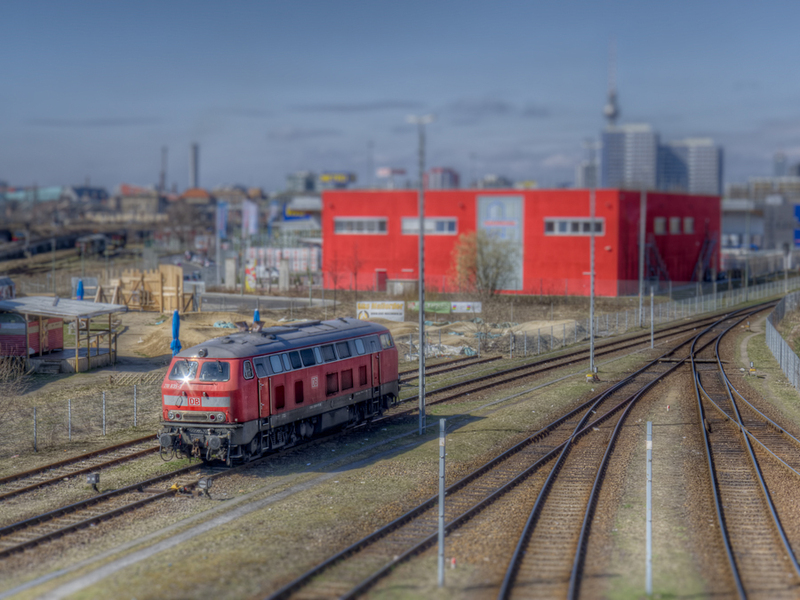 murphyz – Fantastic processing, and those toy train tracks are just excellent. Nicely done. Jan Winther – Trains and cars are perfect for mini captures like this one – every time i see one, it reminds me of my car collection, I never had a train with tracks though..sigh. Great shot Jacques. I love minitures! Scott Frederick – Another great image from you bud! Jacques – Thanks again, all!! Rob Hanson – Without question, this is the best tilt-shift effect I’ve ever seen. Perfectly executed, my friend!